For future info if you feel like going wider on your next set. If you have alot of money burning a hole in your pocket you can't go wrong with the Eagle F1 GT's, They check all the right boxes for a summer street tire...but they are like $330 a tire. The Sumitomo HTZR's aren't bad considering they are the cheapest option in that size at $140 ea. Edited by Blackmount, 17 March 2017 - 01:47 PM. Those should look great with the right stance. Nic choice in tires too, I got BFGoodrich sport comps too. Only curious now, if I will need to put on some longer studs to make up for the spacers....??? at 12MM I would put longer studs on. It might have just been a better idea to go with 15mm spacers that bolt onto your hub and have their own studs... I know good ones can be pricey though. Very Anxious to see how it looks though. Edited by Blackmount, 21 March 2017 - 02:15 PM. Yeah limited options in that size for sure. I had the Eagle F1 GT's on my Vette, they dried out pretty fast and the car was super easy to slide around after a year. A lot of Camaro guys run the Sumitomo's. 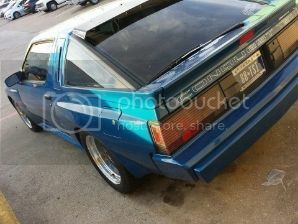 Will have to check out the M/T's for my Starion once these discontinued Continentals wear out. My front wheel studs are about 9mm longer than my rear studs are. You might check your wheel studs to see if yours are the same way. If so, I'd say bolt those wheels on with your spacer and drive it. Edited by EricSQ, 21 March 2017 - 02:31 PM. Edited by Preludedude, 21 March 2017 - 02:36 PM. I have 15mm on my 3000GT VR4, I did not have to trim my studs.. I cannot comment on the stock lug length, but alot of wheels have holes in the back of the hub that are the same spacing as the bolt pattern. I believe this is done for weight savings, but most wheels they are deep enough to let your stock studs poke through... I used the supplied nuts with the spacer to bolt it to the hub and it worked out great. Different wheels, different car, but I was hoping that might help. Also if you do end up going that route. Make sure the nuts the spacers come with are Acorn shaped so that they will center the spacer to the hub correctly. Also your car looks SUPER clean with those wheels. Looks fairly Period-Correct too. Killer choice! They are sitting perfect. With a 15mm it depends on how deep the recesses between the holes in your rims are. Stock rims will just barely hit the studs. Best practice is to cut the studs down to avoid an unsafe situation where the rim is sitting on top of the studs when tightened. Most of those spacers come with low profile nuts that sit flush with the face of the spacer. Studs are easy to swap out so it's not a big deal if you change it back later.